Line detection in raster images is frequently performed using the Hough transform. 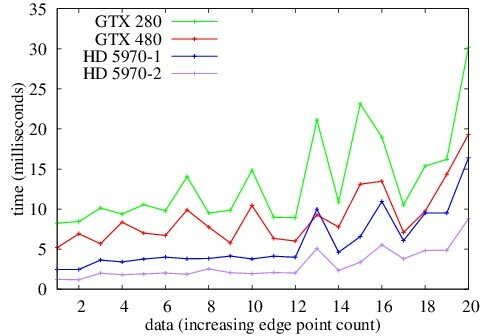 Hough Transform for line detection is difficult to accelerate using the GPU because it essentially requires rasterization of sinusoids into a high resolution raster of accumulators, which is not a suitable task for GPU. This paper presents a GPU implementation of the PClines - a new parameterization of lines for the Hough Transform. PClines are a point-to-line-mapping and thus the detection of lines uses the graphics processor to rasterize lines into a rectangular frame buffer which is a task very natural and effective on the GPU. 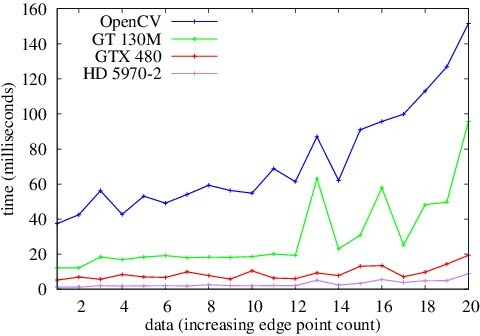 The OpenGL 3.3 pipeline is used to efficiently perform the whole of the PClines-based Hough Transform on the GPU. Experimental evaluation shows that even for high-resolution input images with complicated content, the line detector performs easily in real time, which allows for different practical applications. This research was supported by the EU FP7-ARTEMIS project no. 100230 SMECY, by the research project CEZMSMT, MSM0021630528, and by the BUT FIT grant FIT-10-S-2.